When it comes to my evening skincare routine I must admit that I like to keep it as simple and as minimal as I can. The reason for this being is that I simply don’t like my skin to feel weighed down in products when I am getting ready to go to sleep; not that I do during the day mind you. For a rather long time I have stuck to the same skincare of an evening. Typically, I used to always use the Origins Night-A-Mins night cream (which I do have a backup of), alongside my trusty Kiehl’s Midnight Recovery Concentrate and Avocado Eye Cream. As you’ll see, the last two products still heavily feature within my routine, although there has been a more recent addition which I have being incorporating into my routine within the last few weeks. The Kiehl’s Midnight Recovery Concentrate* is a beautiful evening facial oil which hydrates the skin overnight, helping to give radiant skin come morning. Everything about this product gets the thumbs up from me; I can honestly see it always being within my routine somewhere because it simply works for my skin type, which is oily to combination with areas of dehydration. 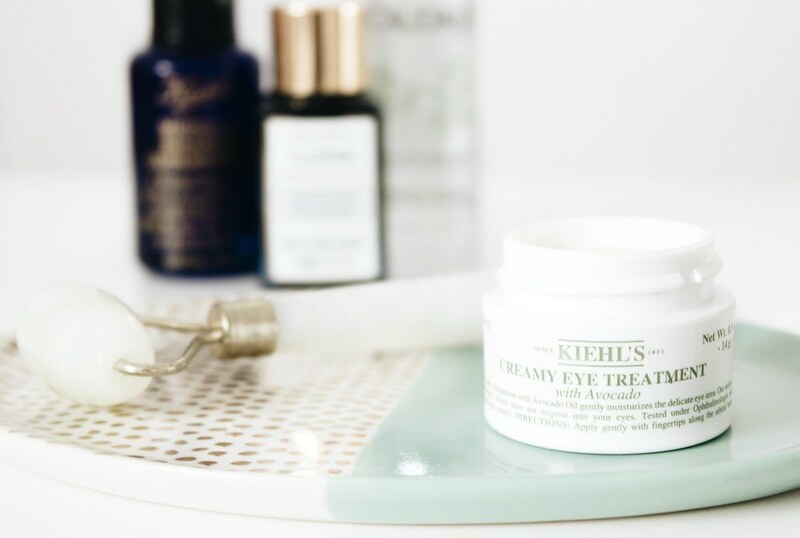 If you’re a regular reader of my blog then you will know that I am quite the fan of the Kiehl’s Creamy Eye Treatment, it is quite frankly the most talked about product on my blog. For a full review of this head on over to this post and of course let me know if you have tried it. For those who suffer with dehydration under their eyes like me, then this is well worth picking up to try. At a price of £20 I think it is an absolute bargain because it lasts a really long time, a little goes a long way and quite simply it works. The Caudalie Beauty Elixir is one of those products which you either like, dislike or feel completely vexed that you paid £12 for something which does nothing…I fall into the latter category. To be honest with you I am using this up, it’s almost gone and once it is I will not be rebuying. For clarification, it is not a bad product, it just does not do anything for me at all other than feel refreshing on my face for all of ten seconds. 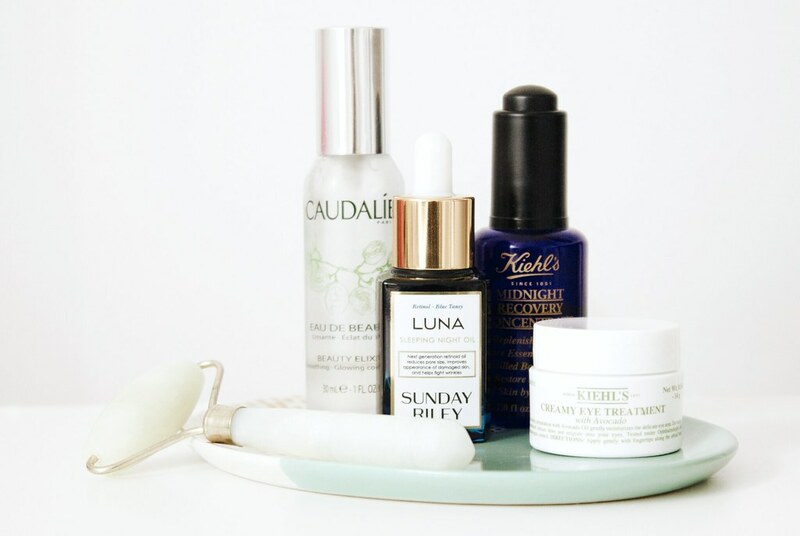 Sunday Riley’s Luna Sleeping Night Oil was probably the only skincare item this year that I just could not wait to get my hands on. Luckily for me it was within the Cult Beauty Box I ordered a few months back which made it a much more purse friendly purchase. Now, I will be up right and honest with you, I have not been using this long enough to make up my mind on it yet, at least I cannot yet say that it is worth the £85 price tag. That being said, first impressions are very, very good. I will be back with a more in-depth review on this one because for that price it is most certainly warranted. The final product upon my night stand is the Yu Ling Jade Face Roller. For me this is a bit of a princess product, it is certainly not necessary however I am very glad to have it because when I do use it regularly I do notice that my skin looks better. It is an odd one this, I was not expecting to fall for the whole idea of massaging your face with a cold hard rock, yet I am very much into it. Puffiness be gone. Do you use any of the above beauty products of an evening?